Graham Park of Langholm CC. Langholm got back to winning ways with a resounding victory at the Castleholm over Lanercost, who are top of the Eden Valley Division One table. Langholm finished on 227 for six in the 40 allotted overs, with Duncan Elliott top-scoring on 59, giving them victory by 122 runs. The Langholm batsmen got off to a great start against the speedy Lanercost attack and the opening stand went beyond 50 for the first time this season, with Graham Park once again looking in good form. Alas, with the score on 76, Park was caught in the slips for 39 by Brown off Robley. Skipper Tony Steele joined Elliott and they took the score over 100 before an interval at 20 overs. The score had reached 141 when Elliott fell for 59, caught by Robley off Wright. This brought Nicky Piszczykiewicz in to join Steele (28) but they only added six before the latter was out, bowled by Wright. Next in was Gregor Park, back from injury for the first time this season. After taking his time, Nicky P finally found his range with successive sixes but he fell soon after for 25, bowled by Wright with the Langholm score 181 for 4. Dave Steele joined Gregor Park and they took the score over 200 before Park went for 19. Langholm were looking for quick runs as the overs started to run out and, with the score on 219, Dave Steele succumbed for 16, bowled by M. Brown. Chris Stewart and Steven Johnstone added a further eight runs as Langholm finished on 227 for six. Lanercost made a frantic start and clearly looked in the mood for the run chase but, with the score on 15 in the third over, Wilson fell for 14, giving Stewart the catch off the bowling of Graham Park. The same bowler claimed his second wicket when he had M.Brown(14) caught in the slips by Elliott with the score on 42. Another short delivery from Park did for Foster( 27), as he skied it with the bowler himself taking the catch to leave the visitors three down for 64. With Lanercost’s top three now all back in the pavillion, Dave Steele and Jack Pool exerted some control, which soon led to a wicket as Steele clean-bowled Robley for 15. Next ball, he had Kennedy caught behind by the nimble Gregor Park, leaving Lanercost in trouble at 82 for 5. The score progressed to 89 before Baldwin fell for 10, with Tony Steele taking the catch off his brother Dave’s bowling. Two more wickets dropped with the score on 89. First, Graham Park held a catch to get rid of Kennedy, then Stewart caught N. Brown for a duck, with both wickets falling to Jack Pool. With the score on 98, Pool claimed his third wicket, clean-bowling Granville for four. The last pair took Lanercost past 100 but Bailey Donaldson finished it off, having Blagden (1) lbw and Lanercost all out for 105. In the home bowling Pool had 3 for 12, Dave Steele 3 for 19, Graham Park 3 for 42 and Donaldson 1 for 0 off one ball. 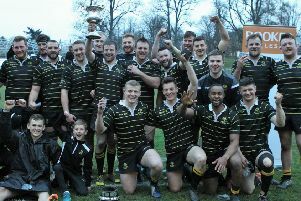 It was a great victory for Langholm after the disappointment of the last two weeks. They play second placed Carlisle 3rds on Saturday with an early start at noon.